Citation Information: J Clin Invest. 2017;127(11):3923-3936. https://doi.org/10.1172/JCI95442. Netrin-1 is a secreted protein that was first identified 20 years ago as an axon guidance molecule that regulates midline crossing in the CNS. It plays critical roles in various tissues throughout development and is implicated in tumorigenesis and inflammation in adulthood. Despite extensive studies, no inherited human disease has been directly associated with mutations in NTN1, the gene coding for netrin-1. 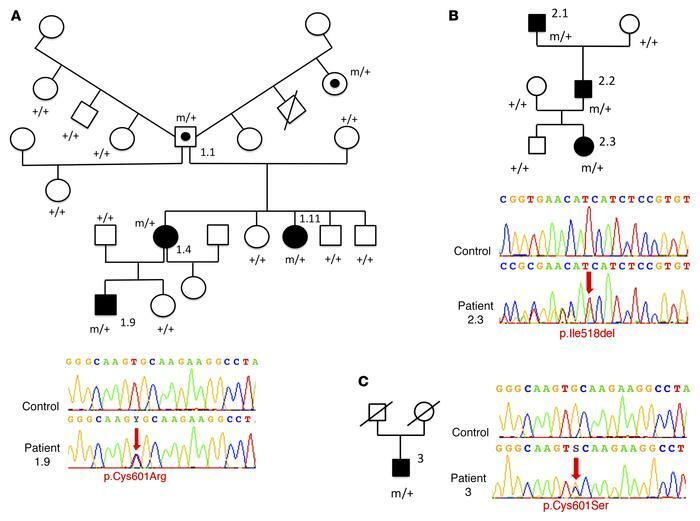 Here, we have identified 3 mutations in exon 7 of NTN1 in 2 unrelated families and 1 sporadic case with isolated congenital mirror movements (CMM), a disorder characterized by involuntary movements of one hand that mirror intentional movements of the opposite hand. Given the diverse roles of netrin-1, the absence of manifestations other than CMM in NTN1 mutation carriers was unexpected. Using multimodal approaches, we discovered that the anatomy of the corticospinal tract (CST) is abnormal in patients with NTN1-mutant CMM. When expressed in HEK293 or stable HeLa cells, the 3 mutated netrin-1 proteins were almost exclusively detected in the intracellular compartment, contrary to WT netrin-1, which is detected in both intracellular and extracellular compartments. Since netrin-1 is a diffusible extracellular cue, the pathophysiology likely involves its loss of function and subsequent disruption of axon guidance, resulting in abnormal decussation of the CST. Pedigrees of the CMM families and distribution of the mutations in NTN1. (A) Family 1 (from France) with a C601R mutation (the unusual family tree is a result of individual 1.1, who had children with 4 different women), (B) family 2 (from the United Kingdom [data were collected in New Zealand], which was previously identified as Family C in ref. 33), with an I518del mutation, and (C) a Canadian sporadic case with a C601S mutation. Black symbols represent individuals with CMM, symbols with an embedded black circle indicate asymptomatic carriers, white symbols indicate unaffected individuals, and symbols with a diagonal line represent deceased individuals. Squares represent males and circles represent females. m, mutated allele; +, WT allele. Electrophoregrams confirm the 3 NTN1 mutations obtained by Sanger sequencing. Red arrows point to sequence changes. Electrophoregrams were obtained with SeqScape software, version 2.6 (Applied Biosystems).